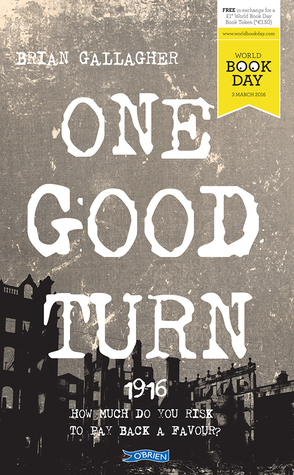 The children’s short story, ‘One Good Turn’ by Brian Gallagher, tells the emotional tale of a young boy who finds himself in a difficult situation in the months after the 1916 rising. At first 13 year old Gerry Quinn thinks he has finally struck gold and caught a break, but soon he realises everything good in life comes with a price. Gerry comes from a very poor lifestyle, living in a shack for a house, with his drunk uncle after his parents died. In the midst of the chaos of the 1916 Rising, looting was quite common and Gerry took this opportunity to get himself some much needed clothes to keep himself warm for the winter. However, months later, as Gerry’s luck seems to be turning around, disaster strikes; a witness to his crime threatens to turn him in to the police. Fearing that he will lose his job or be sent to a brutal reformatory school, Gerry asks his friends Emer and Jack for help. Jack and Emer have their own secrets from the Easter Rising, and helping Gerry is riddled with danger and consequences. Does one good turn always deserve another? Personally I really enjoyed this book and found myself feeling really attached to the characters towards the end. The main character, Gerry, really has gone through a lot in life, and just when things were actually looking up for him, life throws yet another curve-ball his way. The story itself was very well written in my opinion and the character development was really well done. I felt like I was on the journey with the characters, opposed to watching them through an obscured screen, like so many books I have read in the past. I would say that this book would especially appeal to anyone from Dublin or anyone who is familiar with the main streets of Dublin city centre, as that is where the majority of the book takes place. Also the characters use street names as reference points throughout the book, some of which went over my head as they were foreign to me. This book is full of suspense and not boring in the least. If you are interested in a short interesting book with some historical significance then I would definitely recommend One Good Turn for you. As for age-appropriateness, I would say that anyone above the age of 9 could read and enjoy this story, not just children. This book has the historical relevance of the Easter Rising without being gory or too emotionally draining. It also shows some of the Rising aftermath through the eyes of children, which is a story not often given too much attention, and definitely worth a read.